Some good fishing has been had over the past week with great bait fishing in Eucumbene, and fly in the rivers doing very well. Rivers:- Have been fishing well with the Eucumbene and Thredbo rivers holding good numbers of fish. Plenty of rainbows have been coming out of the Eucumbene with beadhead nymphs being the most consistent. Woolly buggers fished down and across have also been effective. Great fishing last week. We walked the banks of the Eucumbene river and got plenty of fish, mixed sizes and good mix of rainbows and browns. We kept just a couple for the smoker. The weather wasnt great, but it provided enough surface movement for us to be able to get close to the water and cast at fish we could see without spooking them. Sight fishing downstream with nymphs is certainly an exciting way to fish. Small nymphs were the ideal, but we also noticed them surfacing to drys if the fly was big and ugly enough. Saw heaps of spawning fish as well and we were careful to not wade in the gravel to avoid disturbing the spawning. Anyway, it was a top fishing session with my neighbour and his son also catching a couple as well  first trout on a fly for young Daniel as well. 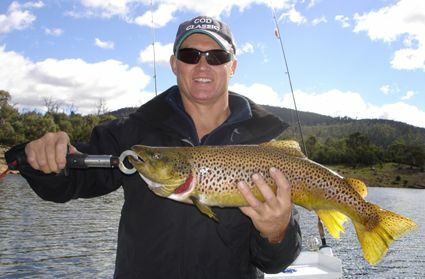 Most of the fish in the Thredbo have been browns from reports to hand. Again beadhead nymphs have been the pick. The Moonbah, Murrumbidgee, Gungarlin are also worth a look for those who don't like a crowd. Lake Eucumbene:- Fly reports have varied over the past week. Daytime fishing has genereally been the best with the evenings and night time fishing a little slow. Bead head nymphs fished slow and deep have been the best fish takers of late. Best areas have been Seven Gates, Cobrabald, Buckenderra and Rushy Plains, with some fish also at Braemar, the dam wall and Anglers Reach. Lake Jindabyne:- Jindabyne reports have improved with some handy fishing in the waste point area along with Sids Bay at East Jindabyne. Some very well conditioned chrome rainbows have been taken from these locations recently. Eucumbene:- Eucumbene trolling reports have been few and far between. With wind playing havoc on some days. Hopefully with some better weather more anglers will be able to get out and troll a few up. Digger, Liam and myself fished Anglers Reach area for a couple of days last weekend with the Young Fishing Club trolling Tassies. Friday was hard going though Liam managed to catch 6 for the day, mostly of good size, unfortunately losing one of the largest rainbows we have ever seen at the boat. Saturday with the rain came more consistent fishing with the morning producing 8 fish made up of a mixture of browns and rainbows. Of note was the fact all fish for both days bar 1, were caught on one specific Tassie..the Golden Oldie, worked a treat. Jindabyne:- Some reports from Jindabyne have been good this week. Photo of my brother Ben with a good brownie from Snowy arm Jindabyne last Sunday 2.9kg and 62cm. Took a 7cm rainbow trout Rapala on 3 colours leadcore. Caught at lunchtime and fought well not wanting to come to the net. We measured, weighed and released it. We go two other rainbows of 500gms and 1kg to the boat early in the morning on rainbow attack and gold min min lures in the Kalkite area. Tried soft plastics and trolled both Thredbo and Snowy arms. Appeared to be a bit of discoloured water coming down the Thredbo but overall water looked good at 16.2 degrees Celsius. Rainbows are loving Powerbait in the Buckenderra arm with several anglers catching their bags. The bait fishing will be very good over the next week with some good rainbows starting to school up in many areas. Best locales to try will be Seven Gates, Buckenderra, Cobrabald, Wangrabelle, Homeleigh Bay and the Dam wall.